I'm really enjoying the releases of classic TSR products at OBS recently. While I have many of the releases from my younger days of gaming, there are some I missed. Kara-Tur: The Eastern Realms is one that I missed. It was missed because my gaming group at the time just couldn't get into the Oriental Adventures rulebook. Although we embraced non-weapon proficiencies, wrapping classic dungeon adventuring (which was all we knew at the time) in Eastern trappings wasn't a good fit for us. 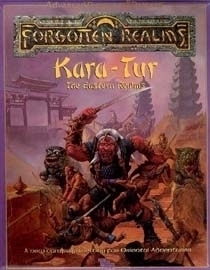 So now I am looking at the Kara-Tur: The Eastern Realms setting some 28 years later and wondering if I would run it now. Well, certainly not using OA as is, I'd have to convert to Swords & Wizardry first. But it might not be a bad conversion at all. Heck, for 5 bucks it's virtually a no brainer. You wouldn't really need to convert it. Just use Ruins and Ronin, then steal all the setting and fluff out of Kara-Tur. The problem with Kara-Tur was the same problem that Oriental Adventures suffered from. Oriental = Japanese. It's all ninjas and samurai and ronin and such. That's one reason I wrote Golden Scroll of Justice, to balance things out with China. Yes, but except for the Wu Jen, all the other new classes are Japanese themed. That makes a difference. Also, among the races, the Spirit Folk seem to be (from my best guess) inspired by Japanese fairy tales like Momotaro or Kaguyahime, where an old barren couple adopts and raises a "special" child. Not many of those from my surveys of Chinese folk tales/myths, although Korea does have a few similar stories. Korobokuru are from Ainu (northern indiginous peoples of the Japanese islands) myths. Hengeyokai can be found in Chinese and Korean myths/folk tales, but the name used in OA is Japanese so that may color people's perception of the race. A lot of the spells seem to be inspired by Chinese myths, so there is that. Similar to Joe, I put out Flying Swordsmen (a clone of Dragon Fist by Chris Pramas) because I thought there needed to be more Chinese fantasy in OA. Of course, now I'm working on a new game called Chanbara, which is 100% Japanese fantasy. And I've got an proto-idea for a Korean themed game after that. I loved the hell out of the Kara-Tur boxed set back in High School. I snagged it and the OA1-OA4 adventures at the same time. I love the campaign setting but agree the 1E OA rules leave a lot to be desired. I'd love to see TLG do an OA-style book at some point for C&C. Or maybe two books, one for China and one for Japan. Tenkar, don't just convert, create a Swords & Wizardry supplement.